You have made plans to buy a new car, but you aren’t yet sure of what car you want or how you are going to sell your current one. There are a few different ways to go about this. Which one you choose depends on what you want. Do you want to sell your car for the most amount of money possible? The private market is the one for you. Do you want to sell your car as fast as you can? Trading it in may be a better solution. When you trade a car in to a dealership for a new one, you are basically swapping your car for credit on another automobile. Trading in is a very convenient way to go about upgrading your set of wheels. This article will explore the four important steps that you must take in order to make this outcome a reality. You will be wanting to make the car in question look as good as you can possibly make it. It will make a good impression on the dealer. It is the exact same principal as dressing up for a date or job interview. Make your car look expensive and you may get a much better deal. Don’t neglect the interior either. A good vacuum won’t go amiss, and some air freshener and airing out will help with any lingering odours that are from all the times you have eaten in the car. Some dealerships may offer you differing amounts. You will not want to take your car to just one, as that may be the dealership offering the least. Hedge your bets by shopping around. Get a few different offers from a few different dealerships, and don’t forget to bring along the maintenance records to any appraisal meetings that take place. This will allow the dealer to see how well you have maintained your vehicle, and they will appreciate the transparency. This builds trust. Negotiations are going to be the method for you to try and get the best deal. Remember that the dealer is going to want to make money out of the car they are getting off you. They will also want the process to be fast too. Have you received two offers from different dealerships that are not a whole lot different from each other? It will be best to sell to the dealership where you are planning on purchasing your next vehicle from. It may also benefit you to have the negotiations for the replacement car purchase separate from the negotiations for the trade in. 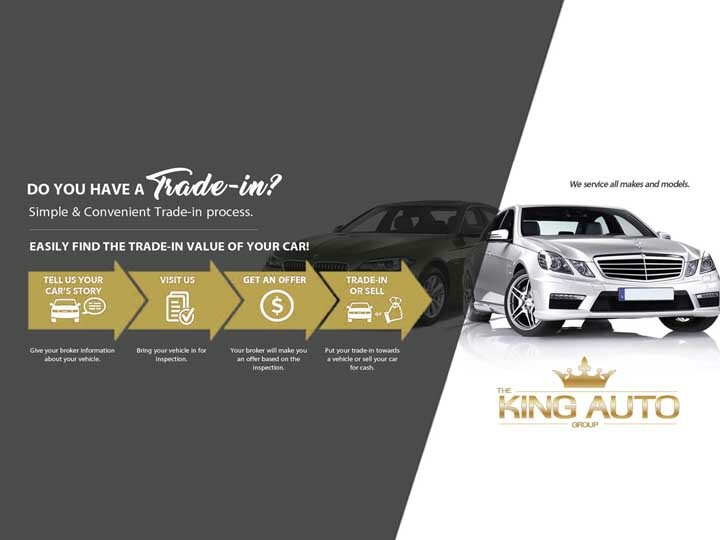 Trade in Car with King Auto where you can get the best trade-in deal in Auckland, NZ.